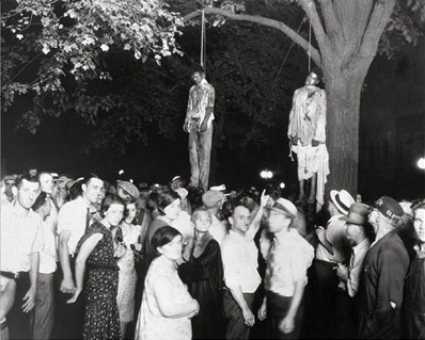 Abel Meeropol, a school teacher in New York, wrote Strange Fruit to express his horror at lynchings after seeing Lawrence Beitler's photograph of the lynching of Thomas Shipp and Abram Smith in Marion, Indiana. He published the poem in 1937 in "The New York Teacher", a union magazine As Lewis Allan. Though Meeropol/Allan had often asked others (notably Earl Robinson) to set his poems to music, he set Strange Fruit to music himself. The song gained a certain success as a protest song in and around New York. Meeropol, his wife, and black vocalist Laura Duncan performed it at Madison Square Garden. Barney Josephson, the founder of Café Society in Greenwich Village, New York's first integrated nightclub, heard the song and introduced it to Billie Holiday. Holiday performed it at Café Society in 1939 and made it widely known and immortal. As of course you did already know, Ms Holiday in her day also did other wonderful things with sad Jewish lyrics and music.